Woolacombe beach has been voted No.1 beach in the UK several times and it’s not difficult to see why. Almost three miles of golden sand stretch out in front of this supreme holiday property and the west facing beach boasts some of the finest surf in the country, attracting surfers and families alike who enjoy playing in Woolacombe’ s renowned safe and stimulating waves. The prominent and well recognised landmark building now comprises four unique luxury holiday homes, all with hot tubs (Four Winds), private outdoor areas, contemporary Stephen Graver kitchens, state of the art Sonos systems, Wi-Fi, Bosche and Siemens appliances, parking spaces, Tesla charging point and of course those unforgettable views! Holiday Home Hunter are proud to act as agents for this amazing property so don’t miss out on this opportunity to holiday in the newest and most sought-after accommodation and location in Woolacombe. Well named, The Lookout has just the best views in Woolacombe. With large kitchen living area with windows on all four sides it benefits from floor to ceiling glass on both the south and westerly aspects. Ultra-contemporary, The Lookout offers luxury living and 4 large bedrooms sleeping accommodation within this dream space. Complete with Hot Tub area - check out the views - and balcony, you will adore this luxury property. Built and renovated in 2017, The Lookout comprises a very modern living space, even a wow dining room in a large glass box and private characterful sleeping accommodation. The finishes are all contemporary and offer the most discerning visitors the ultimate luxury. A contemporary Stephen Graver kitchen, state of the art Sonos system, 6-person Hot Tub gives you the ultimate space to enjoy your break. 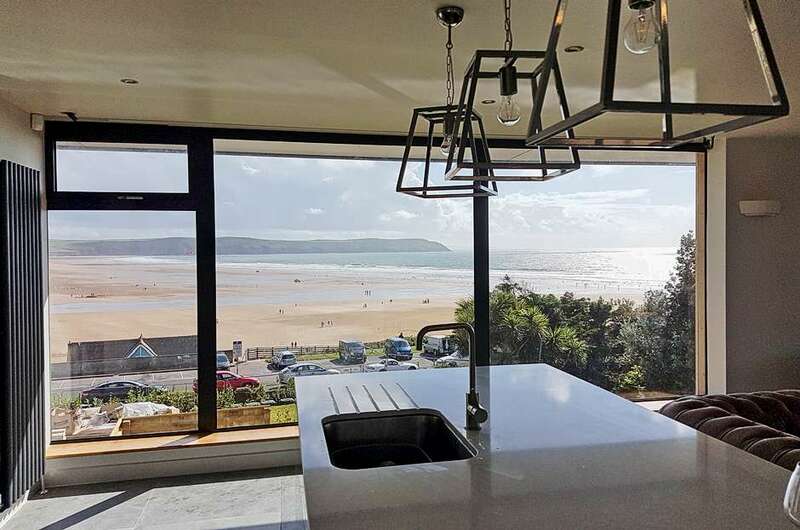 The Lookout achieves something previously never achieved in Woolacombe – The best views, luxury living and still 4 bedrooms for everyone to appreciate. When the sun disappears into the dramatic ocean, the awe–inspiring views allow you to while away endless hours and create memories that will stay with you forever. Ultra-modern, the Lookout’s living space combines a brand new Stephen Graver kitchen, a stylish and unique Glass Link (check out the pictures) for dining and large living space for relaxation. The entire space is complemented by wrap around floor to ceiling windows with panoramic views. For the cooler days there is a good looking log burner. The kitchen comes fully equipped with Bosch and Siemens appliances to include full size dishwasher and washer dryer and Nespresso coffee machine in a friendly island type layout perfect for family / friends gatherings. Look forward to grabbing a bar stool and sitting with your favourite tipple whilst chef prepares his / her culinary delights. Enjoy the results from the stunning 360-degree glass link or romantic table on the balcony – the choice is yours. All the time the views are stunning. There are 4 luxury bedrooms in the Lookout all fitted out with crisp linen bedsheets and throws in the most up to date colour schemes. The spacious Master Bedroom with Super King size bed benefits from a luxury en-suite with stunning freestanding bath and shower, its own dressing area and 3 large windows. Upstairs there are 3 other bedrooms sleeping a further 6 people. One with queen size bed, one with a double and the other with two single zip n link beds that can be made into a super king bed (please advise your choice on the booking form as you book). The property can sleep 8. The Lookout has both balcony and private courtyard available depending on your mood. Both areas afford you great views of the sea and horizon, so the only problem will be choosing. The private courtyard comes complete with its own Hot Tub, table and chairs for alfresco dining. There is off road parking for up to two cars (un-allocated). A third car parking space may be available upon request. A £500 security deposit will be pre-authorised and then released again after the holiday..